Well the day of the big Ladies Tea has arrived. Clara and Winnie were so busy getting everything ready for this afternoon. I didn't get a chance to tell Clara, I'd decided to be of service to the girls as a waiter. So I just showed up about 1:30p.m. all dressed up and ready to work. Clara had just finished decorating the little cakes and setting them on the tray. There were 12 Ladies on the guest list. 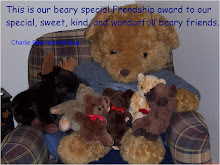 Including one of the founding bears of our hug Tricia Jean. I know it's not polite to talk about a ladies age, but she has been here for 30 years! I'm really glad Clara invited her to come speak to the ladies. I hoped she'd tell one of her stories from back at the beginning of our hug. Earlier this morning I'd heard the guys whispering. I think they're up to something, I noticed that Tigg's camouflage outfit was missing from the closet when I was getting dressed. Grr, I hope they don't spoil the day for the girls. Clara told me what she wanted me to do. She was still fretting bout the dishes not matching. Winnie had just informed her that there were only 6 bear-size plates, not 12. She told her to set one between every 2 ladies, that they could share. She couldn't understand how they'd missed that yesterday. She was also upset that everything didn't match. I assured her that everything still looked elegant and that the food looked delicious, she needn't worry. My goodness, three kinds of cookies; Honey Teddy Grahams,ginger snaps, and crispy oatmeal raisin. Lovely little chocolate cakes, lemon curd, and gummy bears, lemon green tea and ginseng. Who'd care if they had to share a plate. I think there will be lots of left-overs, mom got enough to feed an army. The ladies all arrived and were seated at the table in the living room. Everyone seemed to be having a good time talking and laughing. Just after the tea was served, Clara realised she had forgotten honey for the tea. 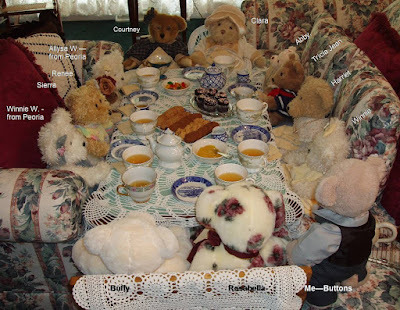 As some bears prefur honey in their tea over sugar. As I headed for the kitchen to get it I saw them. Tigg, Cocoa and Buster spying on the girls. I just shook my head, I had to hurry. Do you see him in the above photo? You can just see his paws and legs. 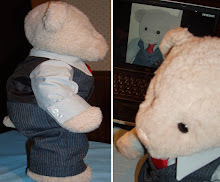 I want to tell you about the young lady I'm standing next to here, Rosabella, I think she's the real spy-bear here. See her ears? I think they meet the spy bear ear criteria, what do you think Bob? Tigg's ears aren't really spy ears, he just thinks he's one. Next to Rosabella is Buffy. I guess Tigg thought his camouflage clothes made him invisible. Sorry Tigg, giant white buttons on camouflage don't scream invisible. Maybe if you press one, heehee. Most of the girls saw him, but chose to just ignore him, hoping he'd go away. and by then everyone knew he was there. He hasn't mastered stealth spying. Anyways, while I was listening, I decided I'd ask Tricia Jean to tell you the story of our hug on my blog soon. Well the girls around here sure like sweets! Even though they ate a lot of food there was still plenty left over. Clara told me to make sure the guys eat some of the leftover cookies and cakes. She said Tigg really didn't deserve any, because he owed them an apology for spying. She must not have seen the other two from where she was seated. I was exhausted, but did help clear the table. Hmmm, I didn't find any tips. I was most happy to get out of my good clothes and back into my jeans. I told they guys about the leftovers and Tigg that he needed to apologize to Clara for eavesdropping and sneaking around the party before he could have any of the goodies. So off he went to find Clara. All in all it was a very nice afternoon for the ladies.